This Cenerentola is charming, but its distinctly fairy-tale atmosphere is slightly un-Rossinian. The fact that the libretto includes no magic seems hardly to matter here. With its two-dimensional, sepia and gold-toned sets that resemble an old-fashioned storybook, the stylized costumes that set the story in the 17th century Cavalier era, the ridiculous putty noses worn by Clorinda and Tisbe, and the puppet show used to depict the Act II thunderstorm, the production’s atmosphere is closer to an English pantomime than an opera buffa. It’s a visually enchanting, amusing production, and for a straight retelling of the Cinderella fairy-tale it would be ideal, but as a staging of Rossini’s morality farce, it won’t suit all tastes. Whatever you think of the staging, though, the cast is fine. 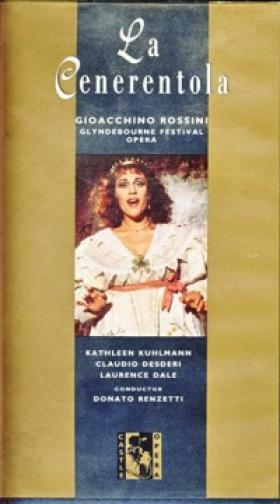 Kathleen Kuhlmann is an endearing Cenerentola, with a warm, rich Giulietta Simionato-esque tone and excellent coloratura. Her handsome prince, Laurence Dale, is dark-voiced for a Rossini tenor, but still offers a charming, if dramatically bland performance. 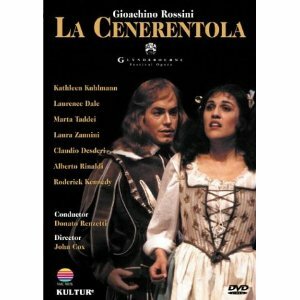 Claudio Desderi, the excellent Dandini of Ponnelle’s 1981 Cenerentola film, is a truly show-stealing Don Magnifico here. His voice is light for the role, but firm and strong, with perfect patter, and his comedy is outstanding. Alberto Rinaldi, meanwhile, is a good, solid Dandini: I suspect it’s due to the tradition of innuendo in English pantos that his scenes with Don Magnifico are peppered with small hints of homoeroticism. 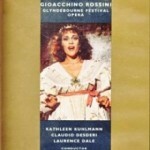 Roderick Kennedy’s Alidoro is dignified yet human, though he lacks the ideal vocal richness and elegance, while Marta Taddei and Laura Zannini make a solid pair of stepsisters, though Taddei’s Clorinda is slightly bland compared to Zannini’s lively Tisbe. Conductor Donato Renzetti leads the London Philharmonic in a charming, lively reading of the score. Do I enjoy this production? Yes indeed and I recommend it wholeheartedly. But Rossini devotees take note; it’s very much a production of “Cinderella.” For a version that’s more thoroughly La Cenerentola, look elsewhere.